In an article published in the Daily FT on 19 February 2015, I predicted the trajectory of the ‘Yahapalana’ Government. In that piece of conjecture captioned ‘Maithri’s Mandate and Ranil’s Royalist Regency’ I said that Sri Lanka was witnessing a constitutional experiment that would soon turn out to be elitist and exclusionary. A popular mandate was being dwarfed by an unelected regency. That there was a clear danger of the popular mandate being misread as a partisan power enterprise instead of the reform project as was intended. 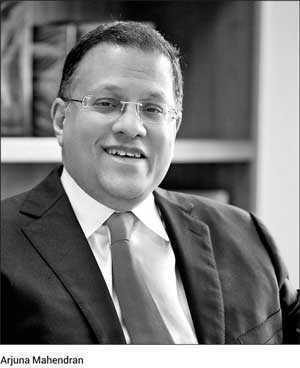 The day Ranil decided to make Arjuna Mahendran the Governor of the Central Bank that was deliberately placed under his own ministerial purview, the innocent utopian dream of a nation suffered a still birth – a foetal death. Instead of a war on privilege, Ranil launched a campaign against the only privilege of the underprivileged – our privilege to hope for change. A magistrate in Singapore will now rule on the findings of our Bond Commission and the alleged offenses committed by one of its citizens while he was empowered to put his signature on our currency notes. President Sirisena insists that it was ‘Great Bank Robbery’ – ‘Maha Banku Mangkollaya’. Prime Minister Wickremesinghe has convinced himself that he had nothing to do with it. Those accusing him of complicity or knowledge of the scam are advised to read the report of the Presidential Commission. As far as he is concerned the commission had not faulted him. Sirisena continues his grandstanding on the issue unabashed and unconcerned. Recently, the President publicly faulted the Government of Singapore for not acceding to a request he personally made to the Prime Minister of the city state to hand over Arjun Mahendran, the Singapore citizen, the preferred choice of his handpicked Prime Minister to be the Governor of the Central Bank in the first 100 days of his presidency. An overblown frog in a small pond is entitled to its hallucinatory croaking no matter who is around the park. Nobody bothers with a toad. It is different for a head of a state. The Executive President can deliver his hazy homilies on the universal sanctity of the Tripitaka and the potency of the noose as a deterrent for drug traffickers. He can question the collective wisdom of the Constitutional Council. If he thinks that it will earn him a second term, good luck to him. When he complains about a state which is mindful of its squeaky-clean global image, he must not expect that sovereign state to remain nimbly numb as the UNP bigwigs did listening to his tirade after reappointing Ranil. The Government of Singapore has responded. According to AFP news agency, a spokesperson for Singapore’s Ministry of Foreign Affairs has said that authorities in the city state have been cooperating with their Sri Lankan counterparts on the case since January. The media maestros of the Presidential Secretariat have responded with graceless spin or what Orwell called ‘newspeak’! No reference is made to the international news agency. It targets the local media that reproduced the news report. The report published by the Sri Lankan media “quoting a statement purported to have been made by a spokesperson of the Singapore Foreign Ministry were completely false”. Then, they construct the truth as they care to make it. I am no lawyer. Laws are drafted, crafted, studied and interpreted by lawyers. That precludes my venturing into space that angels fear to tread. But it does not prevent me from deriving some common-sense understanding of the process by some assiduous reading of the Singapore Extradition Act. It contains a schedule of 30 offences and qualifies their applicability as “aiding and abetting, or counselling or procuring the commission of, or being an accessory before or after the fact to, or attempting or conspiring to commit,” any of those offences listed. In clause 7 (1) the Singapore Extradition Act defines the restrictions ‘on surrender of persons to foreign states’. A person shall not be liable to be surrendered to a foreign state if the offence to which the requisition for his surrender relates is or is by reason of the circumstances in which it is alleged to have been committed or was committed, an offence of a political character. The President who declared the Tripitaka as a national heritage and is now seeking to make it a world heritage while advocating the noose to punish drug dealers seems to have gone down the political avenue on the subject of Mahendran’s extradition. It must be maddening to hold the weight of an executive presidency. Singapore is one of the four top financial centres of the world competing with New York, London and Hong Kong. Among global financial centres it is by far the most stable with meticulously-enforced laws governing insider trading, market manipulation in securities and futures, corruption and other financial crimes. When it comes to white collar crimes, Singapore has a matchless track record in prosecuting rogue bankers. I may be wrong. The way I read it, our Attorney General must convince a magistrate in Singapore that Arjun Mahendran committed an offence punishable under Singaporean laws by agreeing to be made Governor of the Central Bank of Sri Lanka knowing well that his son-in-law was in the business of bond trading and primary dealer of Government bonds licensed by the Central Bank. Arjun Mahendran when he appeared before the commission insisted that he only carried out the instructions of the Prime Minister. When he appears before the Singapore Magistrate, he will very likely maintain the same explanation, defence, rationalisation and vindication. The Bond Commission has not faulted the Prime Minister on his pick of a governor of the Central Bank. Mindful of the enormous burden of the office of Prime Minister, his explanations were in the form of written submissions and he was summoned in person only to seek clarifications. The Prime Minister told the commission that he advised Arjun Mahendran to insulate his responsibilities from his primary dealer son-in-law. The Prime Minister in appointing Mahendran did not consider the possible conflict of interest. Singapore is quite comfortable with strong prime ministers. Its laws applaud and protect officials who comply with orders they receive from the prime minster. I borrowed the caption ‘Innocent Utopian Dream’ from Tariq Ali whose recent book ‘Dilemmas of Lenin’ describes the October revolution as an Innocent Utopian Dream that was strangled in the years of Stalinist terror.